The need for affordable, professional hair tools has never been greater, and now the wait is over! I wanted to create a lightweight, powerful blow dryer that would get the job done quickly and efficiently while keeping your hair healthy and hydrated. This blow dryer features my favorite ratios of heat to wind, customizable ionic options, and a cool shot button to set your favorite style. Lightweight, professional design delivers smooth, shiny, frizz-free results. 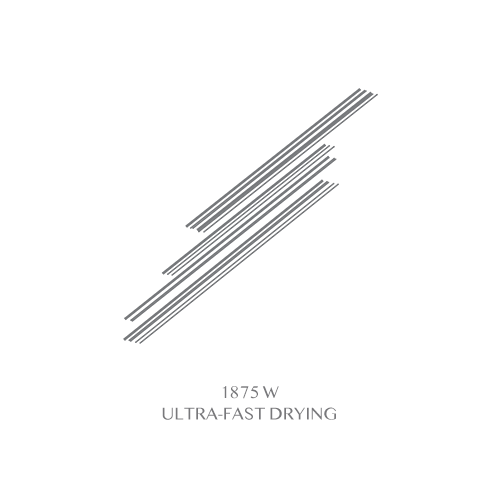 1875W brushless motor technology blow dries large sections quickly, and minimizes the amount of heat exposure on the hair, helping strands stay healthy and hydrated. *Brushless motor technology uses less electricity and has a 3,000 hour motor life, 10x the life span of a standard A/C motor. Create a perfect salon blowout with the smoothing nozzle, or use the diffuser to achieve perfect curls and waves. Cool shot button sets your style in place, for longer-lasting styles with more shine. 2 speeds and 3 heat settings, a 9 ft. professional length cord and removable air filter. Innovative ionic button allows you to tailor your blow dry to your hair type or style. ON/ILLUMINATED = creates smooth, sleek styles. Ideal for thick, curly or frizzy hair. OFF = opens the cuticle to give hair more body and bounce. Use this setting to create volume or add texture.